Malta's little sister island of Gozo invites visitors to put on their walking shoes. Life here moves at a leisurely pace, its rhythms dictated by the seasons, with a rugged landscape and beautiful coastline just crying out for exploration. Inland, flowering herbs and hardy Mediterranean crops cover the small island, and in summer it is fragrant with oleander, bougainvillea, and geranium. The island has some picturesque rock formations, some fascinating caves, and lovely beaches. 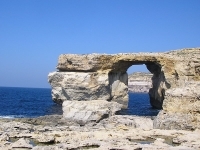 Gozo has some of the Mediterranean's best snorkelling and scuba diving sites. But it is also a place of myth and legend, believed to be the Calypso isle of Homer's Odyssey. The countryside is dotted with old stone farmhouses and Baroque churches, as well as some prehistoric temples and other historic sites of importance. The commercial centre of the island, Victoria, has a sleepy 17th-century feel. The town has many buildings of historical and cultural interest, mostly situated inside the Citadel, the ancient fortified part of the town. In the Citadel, tourists can enjoy numerous museums and wonderful views of the entire island. Gozo is a quiet, ancient, and atmospheric tourist destination and is reachable from Malta's Grand Harbour by ferry in about 20 minutes. We are looking for contributors for our Gozo travel guide. If you are a local, a regular traveller to Gozo or a travel professional with time to contribute and answer occasional forum questions, please contact us.